In addition to selling books, Bibliophile serves alcohol-infused desserts and drinks. With the hiring of new executive chef Keith Miller, Hyde Park’s literary-inspired gastropub Bibliophile will expand its menu to serve a new weekend brunch, high-tea service, and tiny dishes ranging from caviar to foie gras. Beyond these changes, owners Fabiana and Michael Carter recently founded South Shore Hospitality, a restaurant conglomerate, and are looking to open additional restaurants. This latest expansion follows Fabiana’s first successful venture: Fabiana’s Bakery, next door to Bibliophile on 53rd Street. 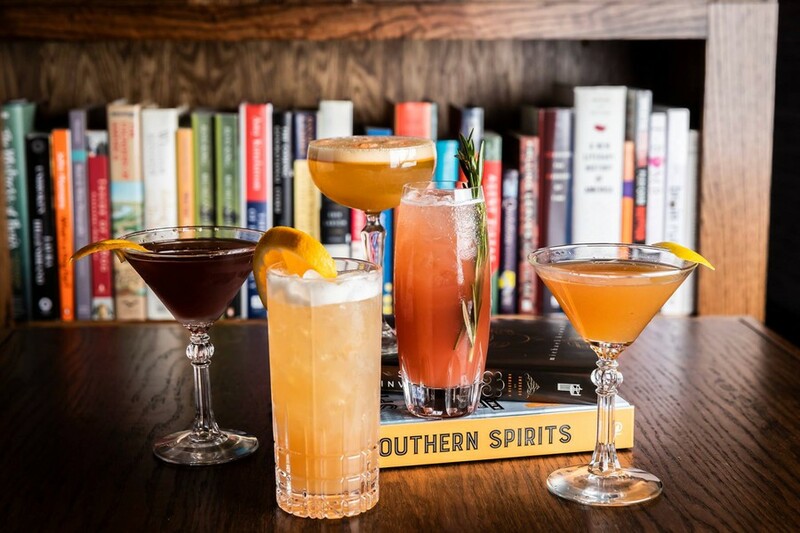 Since opening in October 2018, Bibliophile has received praise from critics and diners alike for its innovative take on a gastropub menu, its alcohol-infused desserts, and bookstore decor and theme. Maintaining the initial success of the restaurant, Michael Carter said, requires the support of a good staff. “We are hiring quite aggressively at the moment,” he told The Maroon, noting that the enterprise is currently seeking hostesses, bartenders, and dishwashers. The Carters have recruited executive chef Keith Miller to usher in a new era for Bibliophile’s kitchen and menu. Miller’s fine dining experience includes a stint at Alinea, the Chicago restaurant with three Michelin stars. “Having worked at that top level, it allows him to quickly and efficiently deliver the vision,” Michael Carter said. Carter hopes to bring unfamiliar culinary experiences to Hyde Park and adjust diners’ misconceptions on these experiences. To that end, the revamped menu will feature a high tea and a weekend brunch. These menu changes will arrive during, if not before, March. “When people see a high tea they go, ‘I don’t know what that means.’ High tea is essentially small bites lunch,” Carter said. The Carters hope to bring these same values with them to South Shore Hospitality (SSH), their recently announced restaurant group. “The plan is to grow, to go as far and as wide as possible. We’re looking around since, as a potential recession looms, we have to insulate as much as possible. We need to put ourselves in a situation where growth can happen,” he said. The Carters are in talks to sign a lease for a new restaurant in suburban Oak Park, which would be SSH’s first business venture outside of Hyde Park. The Oak Park restaurant is slated to keep the same style as Bibliophile. In spite of the big changes to the restaurant and the formation of SSH, Bibliophile is still operating as a neighborhood establishment. Carter said that they try to hire employees as locally as possible. He tries to maintain the culture of his kitchens, which he said, like Chicago, “have their own neighborhoods.” Ultimately, Carter hopes to provide the community with a place where they can fulfill their culinary fantasies.